Not entirely sure where to put this, but if anybody can help here that'd be appreciated. I tried playing the game on my Nox emulator this morning, but kept getting a Network error that said I needed to 'check my network connection and close and reopen the game'. Many attempts to no avail, reinstalling the app doesn't work, and reinstalling the emulator doesn't work either. Posts to reddit have provided no results, and I haven't gotten a full response on the facebook page yet either. If anybody can help me, that'd be greatly appreciated. Attached is a screenshot of the error message. Hey @LiscioVita. We're currently looking into this issue. In the meantime, some players have reported that this error fixes itself if you attempt to log in using a different wifi hotspot. @Joel Unfortunately, it seems that I can't set up a different WiFi hotspot within Nox itself. Unless you meant signing into a different one of the computer. Are you able to download something else to Nox? Something small, harmless and free. Like maybe the McDonalds app? Your not interested in the app itself. You want to know if Google Play Store can reach the internet. If you can download the app. The problem lies with DB and not with Nox. If you could plug your laptop directly into your wifi router that would essentially do the same things as change wifi access points. @LiscioVita I do mean signing into a different wifi hotspot with your computer itself, then log into the game on that network. After that, you should be able to swap back to your normal network and log in without issue. it helps if you can hack your neighbor's network. @LiscioVita. For clarification, do you mean you're unable to connect to any other networks or you can't login even after connecting to another network? @Joel I am unable to connect to any other networks at my current location. 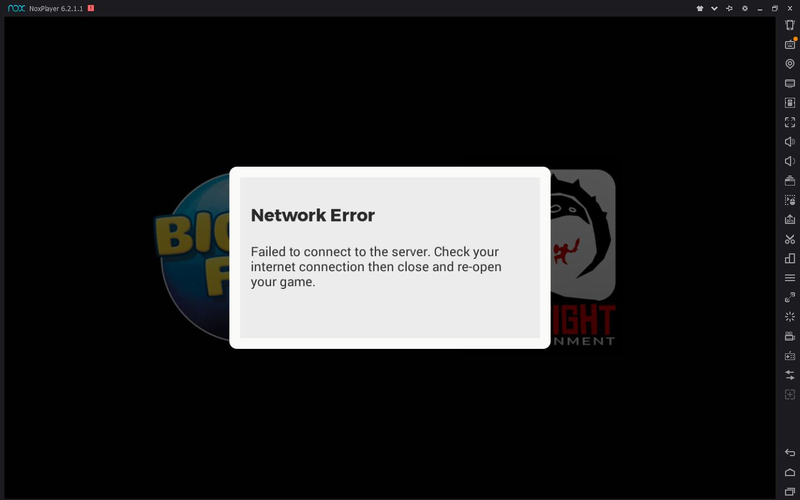 @joel its not that easy to "connect to another network" if your on a wired desktop using Nox and/or Bluestacks. If people were using a laptop, then that's another story. The only thing we emulator users have a problem with is the initial loading screen, not the main DB loading screen. Can you explain why it's showing up now when the other builds never had it (as far as i can tell)? @Dyptheria For some reason, I can't tap into my secondary network that I have at the house. Probably because my ol' laptop only has a 5.0GHz wireless card and the secondary network is a 2.4GHz network. I'll have to try to fix that myself, though. @LiscioVita here's what you can do. Since you're in a laptop, head to a McDonald's or Library and connect to their free WiFi. That should remedy the problem. I was able to update and play on my laptop when I switch from my cable modem to my router. Now I ha e to figure out how to get my desktop to work. It's not like I can just pack it up and walk around with a tower monitor and keyboard. Any help would be appreciated from both me and my guild members. If you have a phone with hotspot capability and data you could try switching to that and back again. If you, like me, do not, then the only currently known option is to take the bloody thing to a mate's house or something. @Yykkil The phone hotspot seems to have worked for me. Though I'm unsure when to switch over to the main network I use. Either at the loading screen or once I'm fully in the game? To be safe, switch after you've fully logged into the game. @Joel So I was able to log into the game, but unfortunately, I seem to have lost all of my progress. (POSSIBLY due to me reinstalling the app/emulator). Is there any way for me to recover all of that stuff? Of course, it's not the BIGGEST loss in the world for me. I haven't bought anything with money off the store. THAT is something you don't need to worry about! Just contact customer support, they'll make sure you get your account back. When you are not around, I use a emulator. If you got a laptop, take it to any fast food location with free wifi and use their wifi to bypass network error. If anyone in the house (or a friend who can come over) has phone with internet access see above. If you have no way to take PC/Laptop to a free wifi or use a phone connection, might have to physically take it to a friends house to log in to their home network. Would be even better if DB was able to make a coding fix for this and released an updated version to the play stores so we didn't have to do this at all. Any chance of that happening @Joel ??? This fixed it for me on my Nox emulator. Going to try side loading the app on Memu next. My Dungeon Boss on the Nox emulator just worked and I didn't even do anything different, same wifi, same everything.. @Joel Did you fix this?